What do you do after you’ve walked down the aisle at four weddings over the course of just a few months—none of them your own? What’s left after you’ve fake smiled your way through countless photos? After you’ve dealt with the smashed guest, the mushed cake, the dashed hopes and the missed bouquets? That’s what Cate Padgett is starting to wonder, as she embarks on stint after stint on the sidelines, watching friends swap bar-hopping for baby naming…while her own love life goes nowhere fast. But is Cate unwilling to settle down—or just unwilling to settle? And can anyone really judge her if they haven’t walked in her dyed to match shoes? Wild, witty and full of weddings to cry over, Always the Bridesmaid is an endearingly romantic comedy about standing out in the crowd even when everyone’s wearing the same celery green dress… and daring to make every day "The Happiest Day of Your Life". “A charming and rollicking commentary on weddings in the twenty-first century. 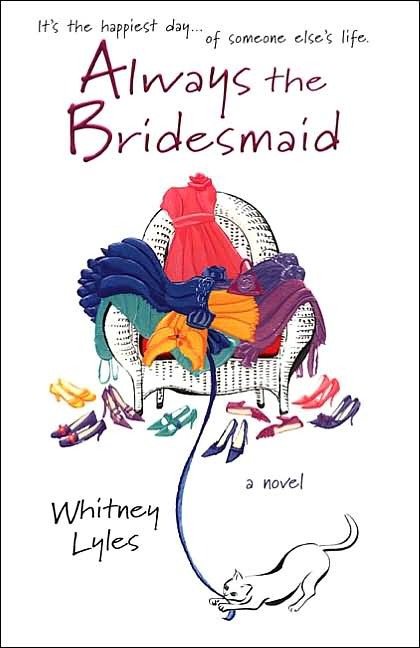 After seeing too many bad toasts to remember, Whitney Lyles— a six time bridesmaid—was inspired to write this heart warming, fun tale of weddings gone wild. Whitney’s own favorite bridesmaid moments – dancing on reception tables with the wedding party, and more recently walking (or waddling) down the aisle in full bridesmaid gear at nine months pregnant. This book has held many exciting firsts for Whitney – her first book deal, her first time in Cosmopolitan, and her first time featured as a question on Jeopardy! Always the Bridesmaid was featured as a Jeopardy! question alongside Jane Austen and Candace Bushnell. You can imagine her shock when a male contestant rang in with the correct answer.